Meandering south from Cordona it wasn't long before we began to get glimpses of a strange raggedy mountain range. The multi-talented co-pilot took a few pictures for later study. More miles, more raggedy mountain and more mystery. 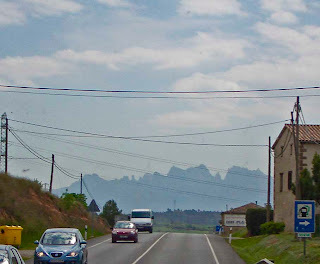 Finally, it dawned on us - the strange looking mountain was our target for the afternoon, the Montserrat Monastery - Montserrat = serrated mountain, duh! One way or another, the monastery is quite a trip. Early writings suggest that activities began here around 880 CE and there are numerous rumors and fairy tales of lights, voices, and abundant miracles along with a black Madonna purportedly carved by the apostle Luke. When carbon dating indicated that the carved Madonna was produced around 1200, like the Shroud of Turin it suddenly became off limits to further study. All that aside, some reclusive stay-at-homes saw an opportunity to opt-out of worldly worries, form a monastery and profit from the ensuing stream of pilgrims. 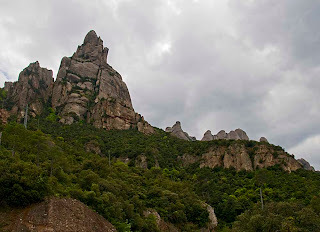 Hence was born the grotto, the monastery, a few shrines and finally the Montserrat basilica. Over the following centuries, the monks have improved their cash-flow with the addition of a funicular railway, later augmented by a cable car, to increase the flow of punters to their restaurants and gift shops built around the monastery. 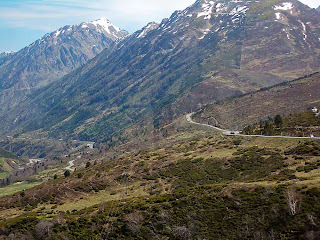 Access by road is via a white knuckle, five mile drive, rising 4,000 feet around endless tree covered hairpin bends and terminating in a stiff parking fee at the top. Nice work if you can get it. See here for some of the views. Having got most of the loose and broken items replaced or reattached to the new coach we bravely took off on the first leg of the shakedown tour. Curious, isn't it, that shakedown has such a sinister alternate meaning - hopefully this will not turn out to be an omen. First stop - St Augustine in northeast Florida. 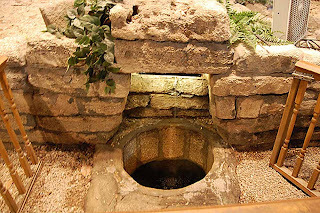 On the north side of town there is, what may be, the oldest attraction in America perversely known as the Fountain of Youth. Supposedly, at this very spot, the Spaniard, Ponce de Leon, arrived in 1513 to claim possession for the Spanish King and La Florida was born. It was within the boundaries of the current park property that the oldest continuously occupied European settlement within the continental United States was formed - St. Augustine, or at least so it says in the promotional propaganda. Anyway, we were little hesitant to shell out for some foul smelling sulfurous spring water and finally skipped the park altogether when we saw this fine lady sneaking out after sampling the Fountain of Youth. Just goes to show how deceptive these things can be. With that settled, we wandered around town in the 95 degree heat, enjoying the awesome humidity and wishing we were dead. Overall, the city has done a pretty good job of tarting itself up for tourists - check it out and see what you think. Nothing to do with bull fights, not even another manifestation of the humble umbrella, Paradors are state owned and operated hotels. Founded in 1928, by order of King Alphonso XIII, there are currently 93 such establishments in a nationwide chain. From the beginning they were meant to provide upscale accommodations set at appropriate distance intervals around the country. The timing was perhaps a little inauspicious as the country was rapidly descending into religion fueled anarchy culminating in an exciting three year civil war in 1936. Even at that, Paradors probably provided great vantage points from which to watch the ravages as the country set about slaughtering its own with the generous, if furtive help, of the rest of Europe and the Russians. 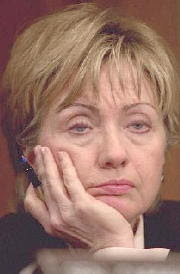 But, why would anyone want to stay in a state owned hotel you might ask? Simple - the Paradors are medieval castles, Moorish fortresses, ancient monasteries, pleasing palaces and stately manor houses, all excellently spruced up with taxpayers money. Although one might suspect that the original scheme was simply a clever ruse to get these historic treasures off the governments budget, the plan does seem to be working with the system being both affordable and well used. 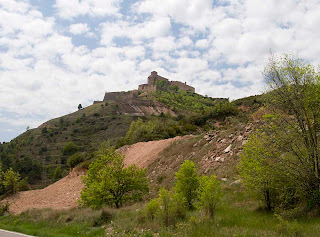 The first one that we stumbled over was in Cardona shortly after we entered Spain and is a ninth century fortress - more numbing information here. 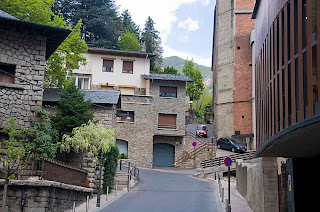 Andorra la Vella - Andorra the Old - is the capital of the co-principality of Andorra. Prior to the political liberation of this tiny nation in the 1990s, the capital city of Andorra la Vella was about it for Andorra. The rest of the country was sparsely populated and extremely rustic. The constitutional changes of 1993 galvanized the country, which has quickly become a vigorous player in tourism with 2 million visitors each year, a magnet for upscale duty free shoppers and a great place to live if you are in a burdensome tax bracket. Better yet, Andorra boasts the highest personal longevity of any country in the world, with an average life span of 83.5 years. Must be doing something right! See more pictures of this incongruous little burg right here. The smallest state in the USA is Rhode Island. At 1,045 square miles however, Rhode Island is more than 2-1/2 times the size of Andorra, a tiny landlocked country between France and Spain, high in the eastern Pyrenees. The population of Andorra in turn, is less than that of the Northern Mariana Islands and indigenous Andorrans apparently are a minority in their own country, being outnumbered by the Spanish, the French and even the English expatriates. Folk lore has it, that Charlemagne granted a charter to the Andorran people in the 8th century, in return for their fighting against the Moors, who were trying to invade France from Spain. A skeptic might believe that the provision of a buffer zone against subsequent attacks might have been a more likely motive, but that might be cynical. Anyway, for the next brief 500 years, the ownership of Andorra followed the fortunes of various incestuous royal marriages and political intrigues finally degenerating to a point where hostilites were imminent. Thus it was, that in 1278 the conflict was resolved by sharing the principality between a Spanish bishop and a French count. Amazingly, for the next 700 years, the 70,000 Andorrans were kept in relative serfdom by the Church in Spain and a French administration that generally had bigger fish to fry. All that changed however, with the development of the European Economic Union. Andorra finally threw off the medieval shackles of the external "princes" and joined the 20th century. Tourism now accounts for 80% of the gross national product and practically every money making enterprise in the country seems to have been built in the last fifteen years. Click here to see more. The annual gross national product of Andorra is now up to three days of Wal-mart sales. Neither of us were particularly looking forward to Toulouse. The campsite was not attractive, Toulouse is a BIG city - the fourth largest in France at 1.1 million people in the metro area - and surely, it would be all modern high rises in tune with Aerobus and the French Space Agency. In fact, we were almost looking for an excuse to give it a pass when, on a May Saturday morning, we found a parking spot in a residential area not too far from the old town. What fools we can be. 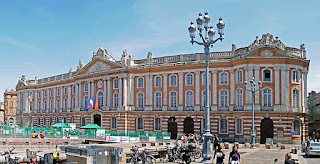 Toulouse, originating in Roman times, flourished throughout the middle ages but slowly sank into liberal apathy during the 18th and 19th centuries, becoming a backwater and completely missing the industrial revolution. In part, thanks to the ensuing absence of socio-economic baggage weighing on other post industrial northern European cities, and in part due to the thirty year father-son mayoral reign of the dynamic Baudis dynasty, Toulouse has consistently been the fastest growing metropolis in France since WWII. This year, 2008, the Socialists regained control of this, the only solvent large city in France, and will likely soon fix that! 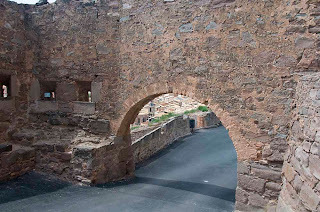 Lots of gorgeous sights in the old town, click here for a sample. 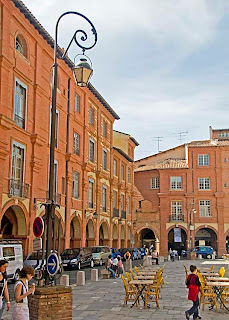 Montauban is a mid-sized city with a population a little over 50,000 and is the capital of the département of Tarn-et-Garonne in southwest France. In 1144 Montauban was situated on the river Tarn by the Count of Toulouse, 30 miles to the south, who had decided to create a bastide as a defense against both English and French royal power. Generally regarded as the first such bastide, Montauban became a model for the layout of other medieval new towns. 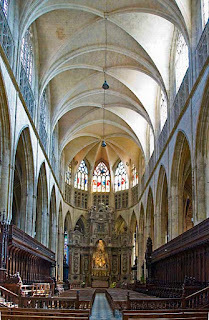 The city was significantly damaged during the Hundred Years War and again, during the 16th an 17th centuries when, as a principal bastion of Protestantism in southwest France, it found itself on the losing side in the Wars of Religion. 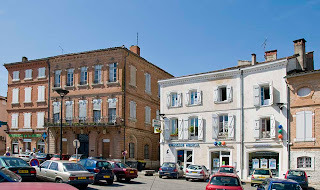 Its fortunes have waxed and waned over the centuries and currently Montauban operates as an agricultural market with diversified industrial activities including electrical, aeronautical, lighting equipment, furniture, and food processing especially of dairy goods. Click here for some sights around town. Weaving along the N20 toward our goal for the day we came to the small town of Caussade and promptly called timeout for lunch. Caussade is in the Tarn-et-Garonne department of the Midi-Pyrenees region - Midi-Pyrenees, that's exciting, there must be mountains in our future! Caussade, with a population of just a few thousand, has a tiny old town which is being aggressively rebuilt, a tired old church, an historic house and that's about it. For a closer look, click here. Cahors, along with Sodom, is vilified in Dantes Inferno as a wicked place. 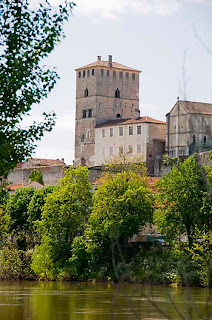 The Church had declared Cahors as a sinful place at the time of the religious wars, because bankers in the city were charging interest on loans - imagine that, a banker charging interest! In the Church's doctrine, all interest was usury and usury was a sin. The Cahors area has been inhabited since Celtic times, when the easily defended udder shaped loop in the Lot river was first settled. Since its economic peak in the Middle Ages the city of 20,000 has slowly declined and today relies increasingly on tourism. Jacques Duèze was born in Cahors in 1249 and he went on to become Pope John XXII, one of the Avignon Popes. The city has a mediaeval quarter and a fortified bridge, the latter claimed to be one of the most photographed sites in France. Click here to see more. "Oh my, what a cutie!" I heard my little bride cry. 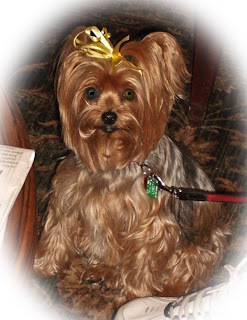 Sadly, she was not talking about this little fellah on the right, found lounging around in a Lazydays' waiting room. Rather, with laser-like focus, she was heading out into the swamp where she had espied her sparkly new coach. Today, ten days later, the coach load of parts shipped by Monaco has been more or less assembled into a working RV by the unhurried hands of the Lazydays blacksmiths. Such a fulfilling experience - a perfect manifestation of the monkeys and typewriters approach. Good job, one supposes, that not much else is going on. In the middle of last week, 75 technicians were laid off, the huge RV display area is all but deserted and Rally Park has probably 40 of the 300 plus spaces occupied. Tough times in Seffner City. For more of this moving experience, click here.